Members of staff from the DVAP conduct Fisheries and Wildlife management Exams at CAVS 8th April 2019. Prof Stephen G. Kiama from DVAP and formerly principal CAVS becomes Deputy Vice-Chancellor (Human Resource and Administration). Prof Kiama is a member of the Department of Veterinary Anatomy and Physiology and as a department we are proud of his progress and congratulate him. The new chairman of the DVAP Prof. Andrew Makanya holds his first meeting with all members of staff. He introduced his manefesto and requested that the members unite and work as a team to make positive progress and change. Prof Andrew Makanya has now become the new chairman of the Departmen of Vet. Anatomy and Physiology after Prof Charles Kimwele handed over office shortly after signing official hand over document over the lunch hour of 20th February 2019. Today 15th and 16th February 2019 College of Biological and Physical Sciences, Chiromo. holds an Open Day from 9.00 a.m. This day is open to all staffs, students and Parents with sons, daughters and relatives who are currently reviewing their degree programmes. Renovations at the Department of Vet. Anatomy & Physiology Lecture Theater and Gross Anatomy have been going on since late 2018 and are now in their final stages. Above is Gross Anatomy side view of the on going work as the renovation near its complition. Prof. Oduma, Associate dean (Right), faculty of Vet. Medicene opening a BVM mentorship session with remarks and touched on issues pertaining academics, time management, positive attitude and good relation between students and lectures. BVM and Wildlife students sit for their exams as the year comes to an end. Dr. Michael Papah a UD grad student earns avian research award at the American Association of Avian Pathologist award presentation ceremony in Denver during the American Veterinary Medical Association Convention in July 2018. Bruce Stewart-Brawn (right). Senior vice president of food safety and quality live operations, perdue Farms, pictured with UD graduate student Michael Papah Babak. The Head of Dept. of Vet. Anatomy and Physiology Prof. Kimwele (Left) recievs the Principal, CAVS (Third right), and other members of the Statutory College Management Board on their visit at the Department today 1st Nov 2018. The purpose of the Boards visit was to inspect the Departmental facilities and the level of cleanliness and maintanance. MSc student Linet Kaaria presented her proposal on the topic: Evaluation of the effect of Asparagus racemosus extract on selected reproductive parameters in female westar rats. At the Department of Vet. Anatomy & Physiology Seminar room. Dr. Ochwangi accampanied by his wife (left) was invited to preach at main campus Christian students fellowship which had organised a Staff Sunday where all staff are invited once annualy to fellowship with the students. This was held on 7th Oct. 2018. Accampanied also by Amos Mwasela, the current Chiromo Campus Christian Staff Fellowship chairman. Effects of Atropine drugs on rabbits eye, Effects of drugs on smooth muscle gastrointestinal tract, roots of drugs administration and more. Head of Dept. Vet Anatomy today received book donations from Pastor Fanuel Demesi and Pastor Walter Bulimu being family representatives of the late Prof. Seth Kisia. Dr.Gakombe gives a talk to First year student pursuing Veterinary Medicine. We were honoured to be visited by Dr.Joyce Gakombe of St.Austins Veterinary Clinic,Lavington at the Department of Vet.Anatomy and Physiology.Dr.Gakombe was giving a talk to First year student pursuing Veterinary Medicine. This week from 1st October to 5th, the technical staff in Vet. Anatomy perform Humane killing & preservation on minimum numberof animals for practicals sessions for the BVM students Sept. 2018 intake. Egerton University BVM students on a three day training in Physiology practicals at the department of Veterinary Anatomy and Physiology. Skin Sensitization test in progress in rabbits and in pesticide products (Abamex and photspho plus. The same test are being done in guinea pigs too. Dr. John Kimani receives visitors from Earlham Institute, United Kingdom. Dr. John Kimani receives visitors from Earlham Institute, United Kingdom. Warking on regeneration research in rodents. Prof. Makanya and Mr. Mugweru measuring Ostrich lungs using the weight displacement method at the Microscopy and Imaging Centre, DVAP. Roof rapairs ant the Department of Veterinary Anatomy and Physiology are going on after the long rain seasons proved damaging. Dr. Dominic Ochwang’i attended the 68th Lindau Nobel Laureate Meeting at Lake Constance, Bavaria Germany from 24 to 29 June, 2018. Prof Maloy (Right) and Dr. Wambugu examines a student on Vet. Physiology on the on going Orals. Dr. Mwangi (left front) and Dr. Nasimolo(Centre) conduct oral examination on a student. Dr. Dominic Owchwangi of DVAP among the Six early career scientists selected to attend the 68th Lindau Nobel Laureate Meeting, dedicated to Physiology & Medicine on 24-29th June at Lake Constance in Germany. BVM Students today 27th June sit for their end of first academic year practical examinations. BVM Students today 27th June sit for their end of first academic year practical examinations. Above a student identify part of an organ in the Gross Anatomy practical. Above a student fills in answers after identifying a slide through microscope in Histology practical. Members of the Department join family of Prof Seth Kisia in the Funeral service held on 7th July 2018 at Friends International Church. Dr. Ochwang’i Dominic, has been selected to attend the 68th Lindau Nobel Laureate Meeting at Lake Constance, Germany from 24 to 29 June,2018. Preliminary skin sensitization test of forray SC300 pesticide to establish its effects on the skin of guinea pig. A consultancy project from OSHWO Chemicals Ltd.
BSc Vet. Medicine and BSc Wildlife Management end of Semester Exams enter their second week this week 19th Feb at the Dept of Vet. Anatomy and Physiology. Above are BVM students doing their Histology practical Exams. BVM students sit for Histology and Embryology Cat. 8th Open Day Coming in February 1st to 3rd of 2018. HoD and patron of the VAPWA addresses the members in the 2017 Annual General Meeting shortly before the Party began. It was also a party to appreciate two members of the welfare who were leaving the Department of Vet. Anatomy and Physiology. Below is Mzee Manyi receiving a gift bought by the members for his ritirement. The head of Department Prof C. Kimwele (third from left) led all departmental staff, academic and non academic, to the Performance Appraisal Training which was held at Kabete on Monday 16th October 2017. DR. DOMINIC O. OCHWANG'I of Vet. Anatomy and Physiology gets a Doctorate in Philosophy in Comparative Animal Physiology on the 22nd Sept 2017. A pose for a photo with the current CAVS principal Prof SG Kiama also of the Department of Vet. Anatomy and Physiology. Hormone Assays Tests have been carried in the department for the Ministry of Livestock. Hormones are measured (assayed) in the blood, and urine to determine “hormone imbalance” in livesstocks. Thika Technical Institute students visit the Department on 20th and 21st Sept 2017 for Physiology practical sessions that were conducted by technologists in the department. The University of Nairobi has advanced its technology by using BVR kits to take students data records. This system facilitates datailed student records including finger prints, passport photos and the like. The exercise has been going on for the students at department of Veterinary Anatomy since 18th Sept. 2017. Preparation for first year BVM practical classes has been going on since 18th Sep. This includes purchase of live dogs, goats and chickens, administration formaline to fix them in preparation for student practical dissection lessons. Head of Department Prof. C. Kimwelwe meets the Academic Staffs to strategize teaching for the first years that just reported this month on 4th September 2017. There was a Suppliers Symposium Meeting at 8-4-4 Lecture theatre at Kabete on 30 Jun 2017 to enlighten staff and non staff suppliers on tendering processes, procedures and requirements. Dr. Ochwangi leads Wildlife Students to field bird watching tour on 2nd June 2017 at Nairobi National Park. Dr. Ochwangi leads Wildlife Students to field bird watching tour on 2nd June 2017 at Nairobi National Park. At the field the students are expected to apply the knowledge they have learnt in class to identify each type of bird they find in the field. The Principal CAVS Prof. S Kiama held a meeting yesterday 30th May with all collage webchampions to assess the collage website and deliberate on how to improve its performance. Egerton University Bachelor of Veterinary Medicine Students visit the Department of Veterinary Anatomy for Physiology Practicals training which runs from 17th to 19th May 2017. The programme is meant to enhance practical skills in physiology. Head of DVAP Prof. C. Kimwele meets with Academic staff to discuss on performance contract. HoD Prof. Kimwele (Right) meet academic staff to discuss the perfomance contract requirments and process. Dr. Pauline Murithi, a postgraduate student at the Departmet of Veterinary Anatomy and Physiology has been conducting research to test for the antiulcerogenic effects of African Nighchades (Solanum Nigrum) at the department. DVAP technical staff meet for a brief training on how to use a spreadsheet developed for managing student attendance score list. Chairman of DVAP, (Right) payed a curtesy visit to assess progress. VC, University of Nairobi Prof. Mbithi met with all the staffs of the Colleges of, Biological & Physical Science and College of Agriculture & Veterinary Sciences on awareness mission on the status quo of the financial state of the University. The head of Veterinary Anatomy & Physiology held a meeting with the technical staff to delibarate on how efffectively they will run the services for the year 2017. Dr. Catherine Kaluwa Kaingu acquires PhD and graduats on 2nd December 2016. 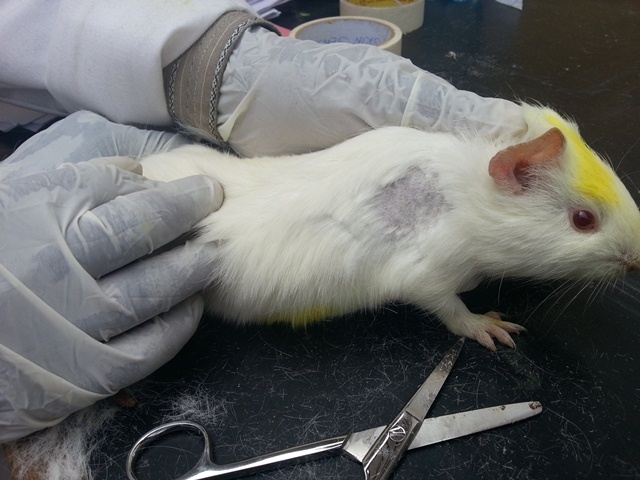 Weighing and marking of rats in preparation for dermal toxicity tests being carried in the department. Toxicological tests have been going on in the department. In this section oral cavage of different dozes are administered on Winster rats to determine the toxicity effects. Skin sensitization on herbal pesticide using guinea pigs. Tests on skin sensitization on herbal pesticide using guinea pigs are being carried in the department. This is to determine the effects of the herbal pesticide on the skin. HoD Prof. Kimwele (third from left)holds an assessment meeting with the departmetal academic staff to assess the students performance in their exams. Experiments on Skin sensitization tests of a new pest control drug are still progressing, initialy the tests were on guinea pigs and now the tests are on irritation on the rabits eye. Chief technologist, Jackson Mugweru carries out experiments on Skin sensitization tests of a new pest control drug. 1st year Egerton University students visit Department of Vet. Anatomy & Physilogy for practical lessons. This was a two day visit where they under went intense physiology practicals covering frog muscles, frog heart, smooth intestinal muscle, electocardiogram, (E.C.G), haemological parameters, spirometry and blood pressure.